In 2001, Sega struck gold with a simple to control yet challenging puzzle game entitled Super Monkey Ball. In Super Monkey Ball, the player took control of one of four monkeys in little round hamster wheels, and proceeded to navigate them through a series of mazes. As I mentioned in my November 2008 review of that game, the beauty of it was in its simplicity. You basically just used the control stick and the A-button to move around, and while that sounds basic enough, the game required such fine motor skills that it has reportedly been used by lacroscopic surgeons to warm-up prior to a procedure. So what would Sega do for an encore? Mess it up, of course! Yes, Super Monkey Ball 2 includes a story mode. You see, apparently someone at Sega felt the need to explain why these monkeys were in their little hamster balls, navigating all these mazes in the first place. Well, as it turns out, the nefarious Doctor Bad-Boon decided to steal all the bananas from Monkey Island, causing Aiai, Meemee, Baby and Gongon to hop in their spherical vehicles and follow him through 100 different stages in an attempt to recover the precious fruit. So this naturally means that mindless exposition and "cute" (and by "cute" I mean completely annoying) monkey chatter between levels. Super Monkey Ball didn’t need this, and neither did its sequel. Essentially, the core gameplay of Super Monkey Ball 2 is the same as the original. Take your monkey through the maze-like course and reach the goal marker before time expires. There are a few differences, though. Of course, the first is the presence of both story and challenge modes. Story mode consists of 100 levels, spread across 10 worlds, and players are given an infitinte number of retries to complete each. Challenge mode takes 90 of those story levels, groups them by difficulty, and limits the number of lives a player can use. The levels themselves are of mixed quality as well. Some of them are classic navigation challenges, while others rely upon different devices and obstacles and thus fell a little too gimmicky in nature. There are also 12 multiplayer minigames, including updated versions of the golf, race, fight, target, billiards and bowling games from the original as well as new ones like soccer, dogfight, baseball and tennis. The minigames are better in Super Monkey Ball 2, but on the whole, the puzzles were better in the original. The graphics in Super Monkey Ball 2 are only slightly improved over the original, but seeing as how the original looked pretty good, that’s not a big deal. Likewise, the music and the narrator’s voice are just as good as ever. But, courtesy of Story Mode, gamers will now find themselves subjected to relentless nonsensical monkey-speak for much of the game, as the little simians cast their little magical spells or whatever they’re supposed to be doing. It will absolutely grate on your nerves, especially the longer you play. Why they just didn’t leave well enough alone is beyond me. The voice work costs the game a full point in the graphics and sound department. 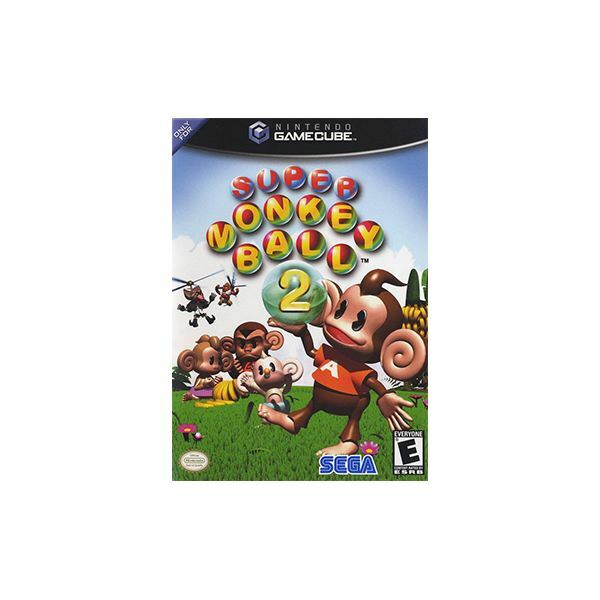 Super Monkey Ball 2 isn’t as good as the original, but it isn’t quite as bad as the game that came after it, Super Monkey Ball Adventure. Nonetheless, if you enjoyed the puzzle action of the original title and think you can stomach the completely unnecessary story mode and the utterly annoying voice acting, then it most likely is worth a rental. Still, I can’t help but think that Sega did themselves a disservice by messing with what was a perfectly fine formula. More articles about Super Monkey Ball.